I wasn’t going to even cover this study looking for correlations between obesity and risks of dying. The predominance of evidence and carefully-designed studies have repeatedly failed to support BMI as a measure of health or predictive of our risks for dying. The value of null studies is wasted with yet more research in that direction. But this study has been so widely misrepresented in the media, that a quick look at what the data actually revealed may be helpful and clear up some myths being floated about the obesity paradox. Reporting research finding anything positive about fat is accompanied by disclaimers, caveats and every effort to minimize its significance. It’s even called an obesity paradox, perhaps hoping we’ll think it an anomaly, rather than where the strength of the evidence lies. You’ve probably caught the news stories about a Canadian study reportedly showing that people with “a few pounds,” who are “slightly overweight,” are carrying “a little extra weight,” have “excess pounds, but not too many,” and are “overweight but not obese” will “actually live longer than those of normal weight.” But that isn’t what this latest study found. It’s what the press release said it found. This study, led by Heather M. Orpana, Ph.D., from Statistics Canada, set out to estimate the relationship between BMI and all-cause mortality in a nationally representative sample of Canadian adults, weighted to represent the total population of the ten Canadian provinces. The database they used to look for these correlations, using Cox proportional hazards computer modeling, was of 11,834 adults (25+ years old) who had participated in the National Population Health Survey in 1994-1995 conducted by Statistics Canada. The data was matched to the Canadian Deaths Database through 2005. During those 12 years of follow-up, 1,929 people had died. The authors adjusted for age, gender, smoking status, physical activity and alcohol consumption in their computer model. They didn’t factor in social and economic status. The results of this epidemiological study were published in Obesity, the journal of the Obesity Society. This study found that none of the relative risks associated with mortality they examined were tenable [explained here], except for one. Age. At age 65, the relative risks of dying rose to 44.35 times compared to age 25; and by age 75, relative risks are 119-fold. We should stop right there, as tenable correlations are the only ones that deserve our focus. But that wouldn’t have made a news story, so what followed was splitting hairs among the rest. ● being obese (BMI 30 up to 35, which includes about 80% of all obese people) was associated with a 12% lower risk of dying. Because physical activity could be a confounding factor, and also associated with age and health problems, they analyzed the data using models that excluded and included physical activity. Physical activity had no statistical effect on their findings. They also analyzed the data to adjust for health by excluding the first four years of follow-up to account for possible reverse causation, where pre-existing illness and poor health could lead to lower BMI and earlier mortality. The results, again, were not statistically affected. 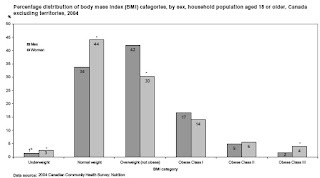 As the authors broke down the data into a multitude of variables looking to parse out correlations, the most significant relative risk they found was among underweight men (BMI less than 18.5) associated with a 2.5 relative risk of mortality, while higher weights were associated with no greater risks for men until those with the very highest BMIs — although the 72% risk was still untenable (attributable to random chance or confounding factors). In contrast, the authors noted that among women, who comprise most of those at the uppermost extremes of obesity, even the most ‘obese’ (obesity class II and higher) was associated with no higher mortality risks, while being overweight and obese up to class II were associated with a 23%-19% lower risk. Putting it into perspective: Rather than a population-wide weight problem, the vast majority of Canadians, according to the government’s Community Health Survey: Nutrition, have BMIs of 18.5 to 35. In other words, nearly every Canadian is at a "healthy weight" range — with no association to higher risks for death and even associated with lower risks. Far from a crisis of people at extremes of weight, only about 2% of Canadians have BMIs under 18.5 and 2.7% have BMIs 40+. As Statistics Canada reports, overweight and obesity are most strongly correlated with rising age among the population. Countering another popular myth about fat people, its Community Health Survey found that 58.2% of overweight and obese Canadians are eating 5+ servings of fruits and vegetables a day, significantly higher than those of ‘normal’ weight. BMIs 27.5-<30, for example, were associated with a 13% lower risk, while BMIs 30-<32.5 were associated with a 8% higher risk, and BMIs of 32.5-<35 had an 8% lower mortality risk. There was no dose-response, lending additional strength to higher weights not being the actual cause for differences in mortality among people. Risks rose steadily with BMIs under 22.5 (18% higher risk with BMIs 20-<22.5; 23% higher risk associated with BMIs 18.5-<20; and 89% higher mortality associated with BMIs under 18.5), yet there are no governments and industries devoted to massive public campaigns against slenderness. The value of this study is that it is a null study, finding no strong association between overweight-obesity and mortality — meaning overweight-obesity itself can’t have a causal role in mortality. Blaming weight for differences in mortality isn’t scientifically supportable. But, like countless other null studies, how likely will this one be used to redirect massive programs and medical interventions and research into other directions with more fruitful potentials to help people? It’s easy to see why the alarm bells are ringing. One in 10 premature deaths among Canadian adults aged 20–64 years is directly attributable to overweight and obesity. Notably, obesity is a significant risk factor for at least five of the top 10 leading causes of death in this country… As much work remains to be done for our vision to fully come to fruition for Canadians, this is also our call for increased government funding towards efforts to better understand the causes of obesity and identify effective treatments, as well as a call for a renewed commitment by all stakeholders who can and should play a role in that process. Solutions require urgent action on many levels, with broad stakeholder involvement matched by political will and grassroots community engagement. Notice how correlations are made into causations and then used to support government action and medical interventions. Yet, other Statistics Canada data provides no support for claims of a population-wide health calamity, either. It has been reporting that life expectancy at birth among Canadians has been soaring steadily for the past century and has reached all-time highs. Just since 1980, for example, life expectancy among men has risen from 72 years to 77, and among women from 79 years to 82. According to Statistics Canada, age-adjusted mortality rates for all causes dropped 6 percent between 2001 and 2005, going from 6/1,000 to 5.63/1,000 of the population. Deaths from chronic diseases popularly associated with obesity are all dropping, too. Cancers down 4.7%, heart disease down 15%, cerebrovascular disease down 20% and diabetes down 1%. Even Statistics Canada acknowledged that it’s difficult to enumerate changes in obesity rates because of the differing methods that have been used to gather information on height and weight among Canadians. So, according to the authors' findings, compared to ‘normal’ BMIs, ‘overweight’ (BMI 25-<30) and ‘obese’ (BMI 30 up to 35, which includes about 80% of all obese people) are associated with a 25% to 12% lower risk of dying. And the risks associated with the ‘morbidly obese’ (BMIs 35+) are statistically the same as those with ‘normal’ BMIs. These findings coincide with other population studies we've examined. False. The study found obesity (BMIs 30-<35) were also less likely to die than people of a “normal” weight, and that the highest BMIs had statistically the same mortality risks as “normal” weight people. So was obesity. The relative risks for mortality associated with the corrected BMIs were 25% to 16% lower among the overweight and obese (BMI 30-<35), respectively, compared to “normal weight.” And the risks associated with the most “morbidly obese” — the highest 3% of the population — were effectively the same as those with “normal” BMIs (18.5-<25). While overweight was protective for people from age 60, associated with a 19% lower mortality risk, their data found that being obese (BMI 30-<35) was also protective. But, obesity (BMI 30-<35) was even more strongly associated with reduced mortality in younger adults (25-59 years of age) than among those 60 years and older (11% and 6%, respectively). 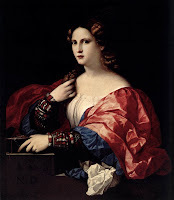 It is difficult for the public to realize that what seems intuitively correct about the dangers of being fat, and our diets and lifestyles, is not grounded in science, but in what is currently socially desirable, in vogue and what we hear EVERYWHERE we turn. Marketing and entertainment, packaged as news or information, however, is not science…regardless of the prestige or popularity of the source. While, in reality, our body shapes and sizes are primarily the result of genetics and age, weight has long been a marker of social class, celebrity status, and an outward sign of adhering to advantageous ideologies. Once, fat was seen as healthful and desirable. There was no obesity paradox. Today, fat is out and thin is in. Even our celebrities keep getting thinner. While fads and fashions may be entertaining and make some people loads of money, their danger comes when people believe they are much more than that. It can put lives and livelihoods at risk. People deserve public health policies and medical care based on sound evidence-based science, not beliefs or correlations. And changing the definition of “evidence-based” medicine to now mean computer modeling to identify correlations doesn’t count. See Sidebar for other articles in Obesity Paradox series.